It’s the stuff that keeps CMOs up at night: the time had come to sunset a beloved product, and customers were going to care. A lot. It wasn’t a question of whether there would be press, but how rough it would be. And social media was about to light up with the news. That very scenario recently played out for ClassPass CMO Joanna Lord — and she couldn’t be more grateful. The fitness startup phased out its unlimited membership option, a disappointing decision for the company and its users alike. But it gave Lord and her team a chance to double down on what product marketers do best: they spent nearly a month preparing for every question and comment, every tweet and customer service call. Internally, they huddled with product, marketing, sales and CX to devise new product offerings that would satisfy — delight, even — the affected users. And in the end, ClassPass emerged with both a more sustainable product offering and a deeper understanding of what its users wanted. For Lord, the only way forward is to fall in love with one process: getting in the mind of your customer. Do that, and even the most public marketing challenge is just an opportunity to make your product better, your team more focused and your users more happy. That tack has served Lord at Classpass, as well as VP of Marketing at home services platform Porch, CMO of loyalty software provider BigDoor and VP of Growth at Moz (previously SEOmoz), an inbound analytics software company. In this exclusive interview, Lord clarifies what product marketing really is, and why founders should consider investing in it sooner rather than later. She shares tactical advice for recruiting, integrating, and establishing the culture of a top-notch product marketing team. And she explains why an organization that puts the customer first, in all things, is wielding a little bit of magic. “Product marketing, at its heart, is about understanding what you’re building, why you invested in it, and how it will benefit the user — and then messaging that understanding to your customer,” says Lord. But if you’re not sure how product marketing is different than “marketing marketing,” you’re not alone. “Whereas marketing is traditionally about leveraging channels to drive prospects or leads — to get people at the top of the funnel and then move them through it — product marketing is more about helping existing customers understand your products and features and engage with them.” Done well, of course, product marketing will drive new users, too. But it’s primarily an exercise in communicating with your customers, and helping them understand the full value of everything you build for them. On the other axis is your product portfolio. If your products are complicated, think about investing in product marketing early, even if you’re a small company. "A product or feature can be complicated for many reasons: it might involve a new UX concept, the pricing might scale with usage or it may entail an upfront commitment from the user before it's fully unlocked," says Lord. Does this feel like an evolution or a revolution to the current experience? Are you trying to convey a greater shift in strategy or mission with this release? How easy could a customer explain the product or feature to another customer? If you launched this product or feature with absolutely no support or product tips, how easy would it be to understand? Lastly, if you asked your internal teams to explain it to the customer, would they all pitch it intuitively the same way? “By asking these questions, you'll see pretty quickly that what feels simple to the teams closest to the product could easily leave the customer confused without the right product marketing strategy behind it,” says Lord. 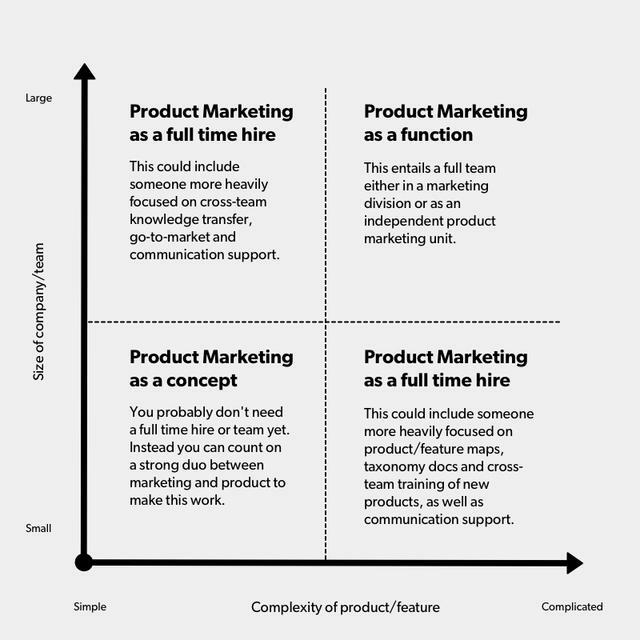 After assessing the size of your company and complexity of your product portfolio, you’ll land somewhere on this matrix. Product marketing essentially lies between product management and development on one side, and acquisition and retention on the other. As such, product marketers own a number of crucial tasks that otherwise fall into a sort of no-man’s-land. Top among them is competitive research; product marketing is also typically responsible for creating a number of crucial definitions, facts, and taxonomy docs for the company. If you’re stitching together value statements to drop into a launch email, it’s time to build out product marketing. It’s a special hire who can sit at that intersection of building great products and messaging them into the public consciousness. When it’s time to invest in a product marketing team, you need to look for a particular combination of hard and soft skills. “As you might expect, I've found that the best product marketers have a combination of marketing and product chops,” says Lord. Candidates need to be well versed in topics that don’t necessarily fit neatly in a single discipline: ideation, agile development, launching releases, go-to-market and demand generation, for example. Lord’s most successful hires have often started in product and found themselves drawn to marketing — or vice versa. “What you're looking for is a respect for both disciplines. Product marketing is not either/or. It's absolutely both,” she says. Drawn to details: Product marketing involves a lot of minutiae, and candidates need to manage it all. Keep an eye out for a project management background when you’re reviewing resumes. In Lord’s experience, a lot of great product marketers come from that world, too. Researches by default: “Product marketers have to be data-driven and love research. They're spending a lot of their time understanding the market, and helping the company understand how to position itself,” says Lord. In-person or UX research chops, and more traditional data experience, can be helpful. Fetches feedback: Your product marketers are a voice for your users, and they need to be excited by the challenge of getting into the customer’s mindset. “They have to have that deep respect for CX and feedback. They have to want to develop something that really serves the customer,” says Lord. Identifies as cross-functional: Few roles touch more people in your organization than product marketing. “Candidates really need to have strong self awareness, but also relationship awareness.” If someone can’t collaborate well across departments and functions, they won’t be able to do the job. How do you handle ambiguity? How do you handle quick timelines? How do you transfer knowledge through organizations? There are crucial soft skills to product marketing too, though. Leave room in your interview to suss out how the candidate would manage the pressures of startup life or the inevitable challenges of coordinating large numbers of busy colleagues. You may also want to consider a homework assignment, particularly if you’re interviewing candidates who have only “unofficial” expertise on one side of the product-marketing spectrum — that is, who’ve held roles in either marketing or product, but don’t have verifiable experience in both. We have this real-world product. People are turning off of it quickly. How would we get to the heart of why? In this case, you want candidates to demonstrate that they know how to link all the feedback channels across the company. Moreover, you want them to prove that they’re scrappy. “They should show you that they understand cancellation surveys, or would put up an on-site survey to understand why people bounce. That they would talk to CX to see what they believe is causing the problem, or interview the sales team, which is probably the number one source for understanding friction in the selling process,” says Lord. Once you’ve found the right person — or people — for the job, it’s time to integrate them with the rest of your team. Particularly when it comes to onboarding your first product marketer, proceed thoughtfully — there’s actually more of an art to it than you might realize. The number one mistake I see is failing to make sure that product managers and marketing managers have a shared definition of what product marketing is. “It doesn't matter who you hire. If a product manager feels like someone else is defining their product, or a channel marketer feels that some other person is telling them how to sell, it will fail,” says Lord. A successful product marketing organization, then, needs a clear mandate and company-wide consensus. Like many other elements of the organization, it also needs a steady, coherent product roadmap. Of course, product marketers themselves also play a crucial role is proving their worth and establishing a team that the rest of the organization respects and values. In Lord’s experience, that boils down to open, humble communication. “The product marketer has to be an expert at asking questions and understanding both the customer and their internal stakeholder,” she says. The key to great product marketing is to remain two things: objective and a team player. One of the best ways to do both is to swap opinions for data-driven analysis. In addition to fostering cross-departmental collaboration, product marketing teams can and should usher in a culture of experimentation. Beyond that, there’s no single experiment every startup to run, no rule for how to approach testing; that depends too much on your company’s roadmap and relative maturity. But every startup does need to weigh the three key ways to grow a company: acquisition, retention, and monetization. And if you’re like most startups, there’s a good chance you’re weighing them wrong. Another common testing pitfall? Asking questions that are too broad to yield precise, actionable insights: “What do you want us to build?” or “What's the number one problem you have?" The big-picture questions you might ask on the road to product/market fit are not the same questions you should be asking when it’s time to scale, and beyond. To avoid spinning your wheels — and wasting valuable customer time — always be specific in your tests. The rigors of experimentation may bump up against the startup’s need for speed, but resist the temptation to rush it. Process is crucial: Identify your thesis and specific goal, the cohort you will be testing against, and how you will execute your test. Then meet regularly with the group that’s contributing to the experiment to assess the test itself. Successful product marketing can’t exist in a vacuum, though. It requires a commitment from everyone else in the organization to share their insights and be a voice for the customer when the opportunity arises. To start, that might be as simple as requiring every team to send out a weekly report of key findings: test results for the data-driven teams, or a summary of the week’s highlights and lowlights for teams whose work is more qualitative. “You're just trying to bring knowledge, and bring an experimentation-first culture,” says Lord. But “sharing” means more than disseminating test results; it needs to be part of your company culture. “Anyone can walk up to our CPO with an idea or say, ‘This test is showing me X and Y. Who should I connect with on your team to talk about whether or not this could become a feature or a product?’" It’s okay to put parameters on that openness. At ClassPass, a test has to demonstrate that something could yield 1,000 subscribers before it’s considered for product development. The goal is simply to empower any team member to spot and share opportunities to improve products. By encouraging an open discussion of ideas, you also (perhaps counter-intuitively) make it easier for your team to move on when their ideas don’t make it into the pipeline. Lord says the ClassPass encourages a culture of “disagree and commit” and she suggests other startups do the same. Host a "slay day" where all teams help CX get to inbox zero. Everyone finishes the day obsessed with solving issues for customers. What to build: Here, you’ll want to look at product-engagement metrics, which are what you might imagine: log-ins, usage stats, sales figures. How to sell it: This is the most marketing-oriented task of the product marketer, and it can be measured with traditional acquisition metrics — click through and conversion rates, customer acquisition costs, funnel conversion rates — and the feedback loops you have with CX or sales. Return to the product. The best way to regain that trust and goodwill is always going to be with your product. If you’ve done step one right — if you’ve kept your eye on your mission — this is also where you can also restore your team’s passion and enthusiasm during a difficult transition.